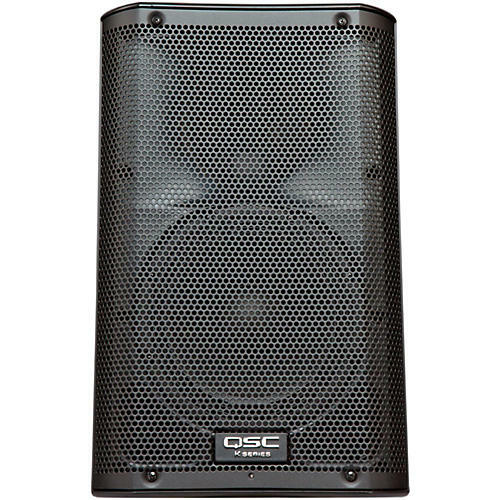 The QSC K8 8" powered loudspeaker features a 1000-watt Class-D power module, and its extremely compact size won't intrude on audience sightlines. Its 105 wide dispersion is a major advantage when the audience is up close to the loudspeaker. Low frequencies extend to 61Hz (-10dB) and the unit outputs an amazing 127dB. QSC's K8 speaker features a 1-3/4" HF device in its 2-way enclosure. The primary differentiator is the resulting output dispersion-the K8 being the widest at 105 and the K12 the narrowest at 75. This radical approach is achievable due to a process called Directivity Matched Transition (DMT). DMT allows QSC to take advantage of a fundamental law of acoustics: smaller diameter woofers have wider coverage patterns than larger ones. The K Series matches the HF device to the LF dispersion, allowing for the smoothest and flattest frequency response possible across the entire sound field. Add to this advanced DSP processing and an enclosure molded from ABS-a material far more rugged and sonically pleasing than conventional plastics-and the QSC K8 Speaker delivers exceptional performance in this category of loudspeakers. Several proprietary QSC DSP technologies are incorporated into the K8 PA speaker. One such technology is Digital Extension and Excursion Processing (DEEP). DEEP allows the K8 to deliver levels of low-frequency extension previously impossible in enclosures of this size. Intrinsic Correction, first featured in QSC line-array technology, use dozens of spatially averaged measurements mapped to the processor to deliver smooth and accurate reproduction across the entire sound field. Preventing amplifier clipping or overload is QSC's proprietary GuardRail technology. GuardRail closely monitors the input voltage and controls the amplifier output stage before the onset of clipping. Unlike typical clip limiters, when GuardRail is activated, the results are all but undetectable-there's none of the typical "pumping" associated with other methods. In addition, user EQ controls are provided to select between subwoofer settings (EXTSUB, VOCAL, or FLAT response). The K8 speaker boasts other user-friendly features. For example, when the PA speaker is pole-mounted, the Tilt-Direct pole socket converts to a 7.5 down-tilt with a simple 180 rotation of the dial. A locking IEC power cord is included, preventing accidental disconnect during a performance. For installed applications, connecting a commonly available potentiometer to the unit's Euroblock connector allows the operator to have gain control from a remote location. Multiple K Series units can be daisy-chained together to one centralized control. Additionally, the QSC K8 Speaker enters Standby mode after 5 minutes of inactivity, conserving power. The entire PA package is housed in rugged and sonically friendly ABS (the sub in birch plywood) with steel grilles and carry-friendly ergonomic aluminum handles. The brain of the system is its expansive digital signal processing. While the DSP functions are optimized using Intrinsic Correction, DEEP, DMT and GuardRail technologies (with the high-pass filter included for use with subwoofer systems), two XLR-combi inputs, each with its own Level control, are provided. Both accommodate line-level inputs and one may be switched to microphone level sensitivity. Phono (RCA) input jacks are also included for connection of consumer electronics sources. Dual XLR outputs are provided for dual "loop-thru" XLR/M connectors and a single XLR jack is available as a summed output. All 3 input sources may be used at once and mixed via the 2 Gain control knobs. the way down to the crossover frequency. The coverage angles of the waveguides are tailored for a smooth transition from woofer to compression driver with far less "waistbanding" or other directivity related anomalies than other products in this class. The K-Series 2-way PA speaker may be pole-mounted, suspended, or yoke-mounted. The K8 yoke accessory kit (not included) allows for either horizontal or vertical yoke mounting, providing a flexible means of attaching The K-Series loudspeakers to a building structure or truss. When suspended deployment is required, M10 threaded inserts support vertical or horizontal suspension, while the integral pole mount socket accommodates 35mm speaker poles for use on a speaker stand or over a sub. The pole socket is designed so that the speaker may be angled down 7.5 in order to cover the audience while keeping acoustic energy off reflective walls and ceilings.